Much as I dislike being stereotyped, I have to confess I’m typically British inasmuch as I love a good queue. They’re so organised; they have a beginning and an end. 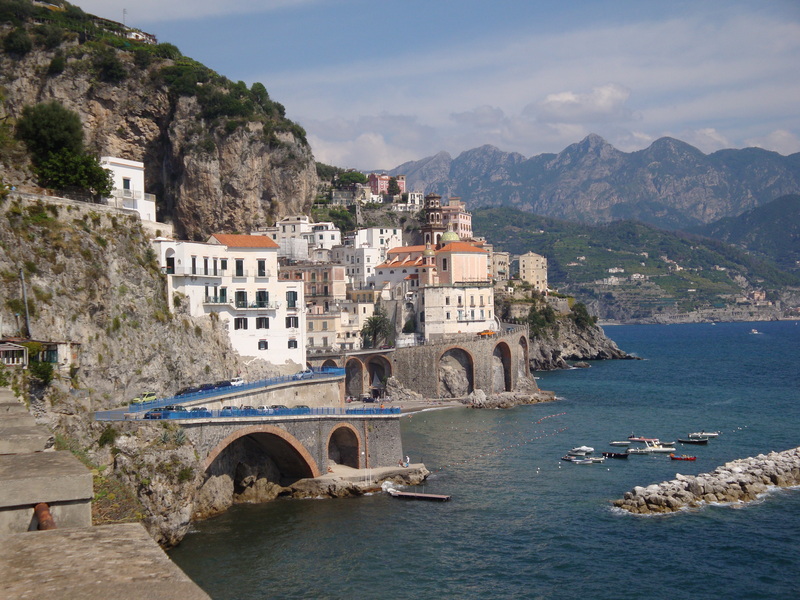 A few years ago, my partner Andy and I had a wonderful holiday in Italy. I loved everything about the Italians, apart from one thing – they simply don’t get queues. Following a day trip to Amalfi, Andy and I formed the beginnings of an orderly queue to catch the bus back to our hotel, only to be advised by an elderly British lady to forget it. What? A fellow Brit telling me not to queue? She was right, though. When the bus arrived it was pandemonium as a heaving mass of people shoved and jostled their way on board. I was momentarily worried that my elderly advisor might struggle in the melee, but she was the first one up the steps! Andy embraced the Italian way with gusto, which was just as well – we’d never have got back otherwise. I’d still be standing in my queue of one! Yesterday I spent well over three hours in a pretty damn impressive queue. When I took my place it stretched back about as far as you can see in the photo below, and it continued to grow and grow. 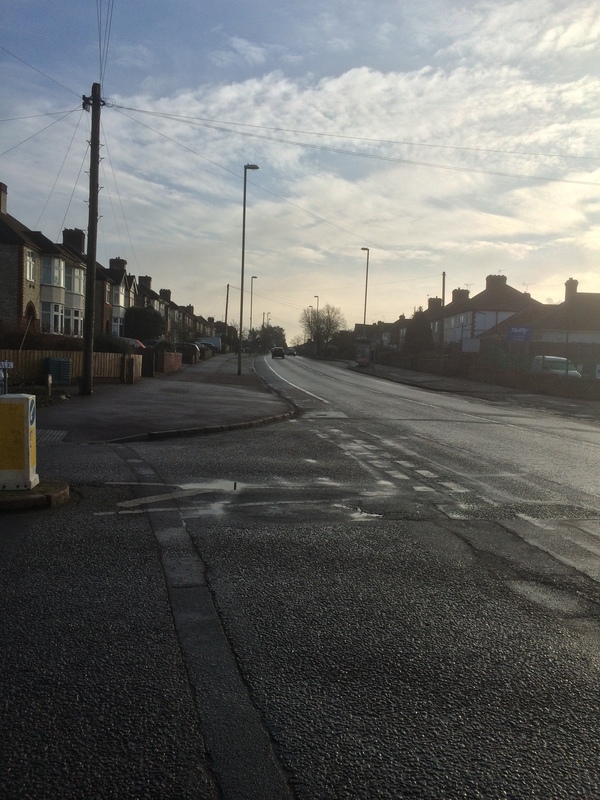 It was freezing cold, it was going to take a while to achieve our objective, but everyone was remarkably cheerful. Whenever we edged forward a ripple of excitement would run along the huge line of people, and we filled the monotony when we didn’t move for ten minutes or more with jokes, chatter, doing the Hokey Cokey and sharing our plight on social media. A local author (not me, obviously!) walked along the queue, attempting to sell copies of his book set during one of the most successful seasons in our football club Cambridge United’s history. Under normal circumstances I would have bought the book and read it (and hoped for his sake that the author had had it properly edited! ), but at that particular moment all I wanted was hot coffee. Poor bloke; the scarf and hat sellers were a lot more popular. So why on earth was I standing in a line of hundreds while frost slowly hardened all around us? 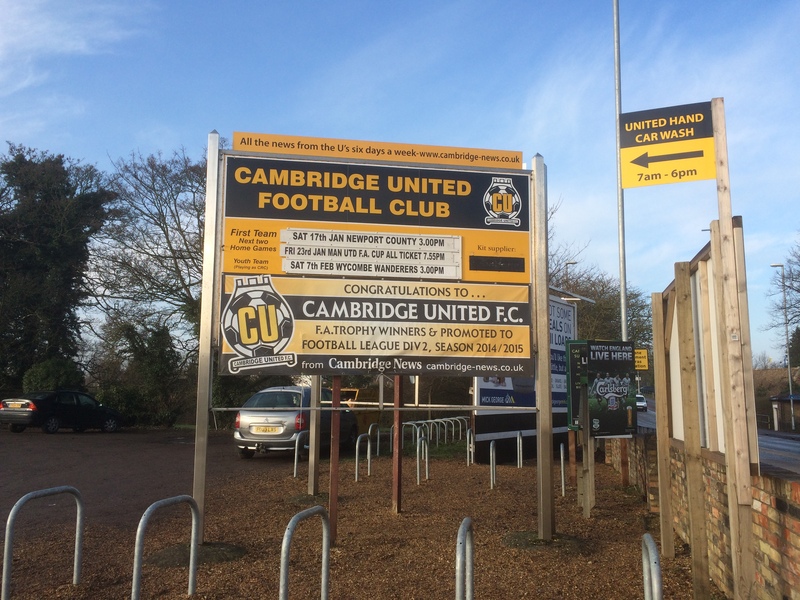 Simple: we all wanted tickets to Cambridge United’s next home match. I’ll give you a clue (if you can read it! ): we weren’t queuing for tickets to the Newport or Wycombe games! Yes, in the grand old tradition of England’s domestic cup competition, the FA Cup, my little club has been handed the tie of the round: at home to the famous Manchester United. 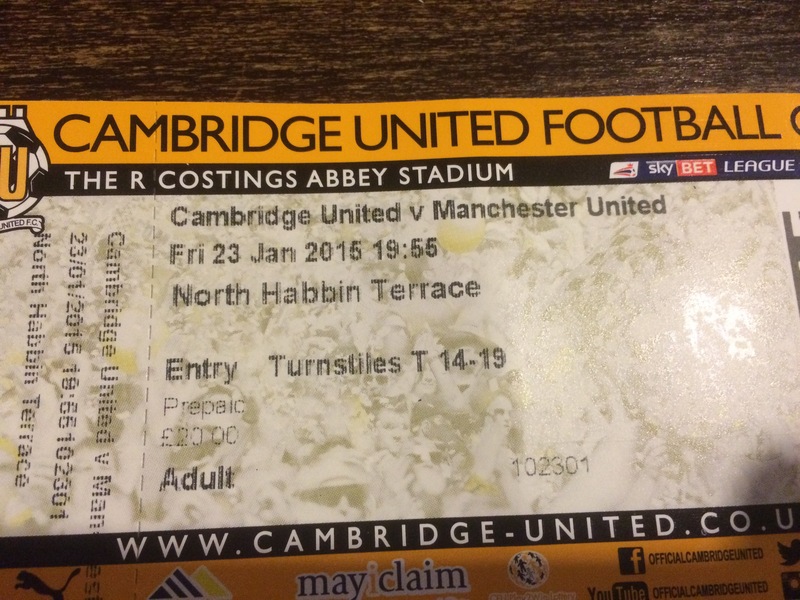 Our ground, The Abbey, isn’t exactly huge, and tickets for the big match are like gold dust. Readers who don’t follow football could be forgiven for thinking I’m mad, and they’re probably right, but on the evening of Saturday 17 January (after having been standing in the cold for two hours to cheer Cambridge to a magnificent 4-0 victory over Newport) I was willing to sacrifice my extremities to frostbite to get my very own golden ticket. By the time we’d shuffled up as far as the entrance to the ground I think my brain was starting to freeze; the guys in front of me were discussing the relative merits of the two concrete mixers pictured on the billboard outside the ground, and I found myself gazing up at the poster and nodding along sagely. Still spirits were high. We’d come so far (slowly) we weren’t going to give up then. My friends and family kindly let me know how warm and cosy their homes were at that moment while I dreamed about the roaring fire in my local pub. Not even some meathead striding past, telling us that we should have bought season tickets as he’d already got his place at the Manchester United match guaranteed, hah-hah-hah, could get us riled. By then there was no way we were capable of having anything as heated as an argument, so the worst he got was a bit of light hearted ribbing. Cambridge United’s chairman came out to keep us company, walking up and down the line offering words of encouragement, which was an admirable gesture and reminded me why I love that club so much. Then finally, finally, we were through the gates and into the carpark. The end was in sight – the portakabin housing the ticket office has never looked so beautiful. I was almost moved to tears, but they’d probably have frozen. At last, that coveted spot at the front of the queue was mine and I was ushered forward by a cheerful steward to buy a ticket from a cheerful vendor (these people, all volunteers, deserve medals – they’d been manning that office since 8am, with only a break for the match, and they were still smiling over twelve hours later). I couldn’t help smiling back, widely.